The Charioteer is prominent in winter in the northern sky. Its Latin name is Auriga, meaning, well, Charioteer. For navigation purposes, it's not important to recognize any mythical image outlined by this five-star grouping. Just recognize its pronounced pentagon shape, distinguished by the bright star Capella on its leading edge, that is, the edge that leads the constellation across the sky on its way westward. For our purposes, it's helpful if we number the Charioteer's stars and refer to them by number, starting with Capella, which we'll call Star One. To the east around the pentagon is the star Menkalinan, which we'll call Star Two. Continuing in this direction around the pentagon, we'll label the next stars Star Three, Star Four, and Star Five respectively. Between Star One and Star Five is a faint, three-star grouping called The Kids, said to represent either children or baby goats. To me, these barely distinguishable stars which don't form part of the pentagon but nevertheless help identify the Charioteer, seem to form the eyes and nose of a long-snouted mouse. 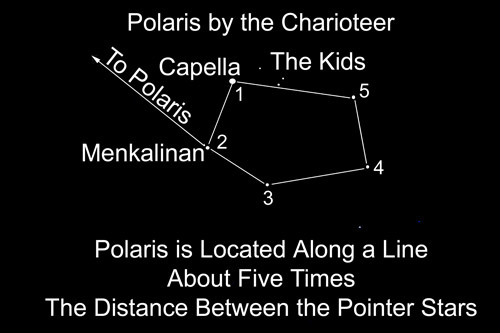 To find Polaris by the Charioteer, imagine a line beginning at Star three, and passing straight through Star Two, and continuing directing out from Star Two five times the distance between Star Three and Star Two. This lines ends at Polaris. The usefulness of being able to find Polaris in a number of ways becomes apparent when Polaris is obscured from view, such as by clouds, tall trees, or anything else. 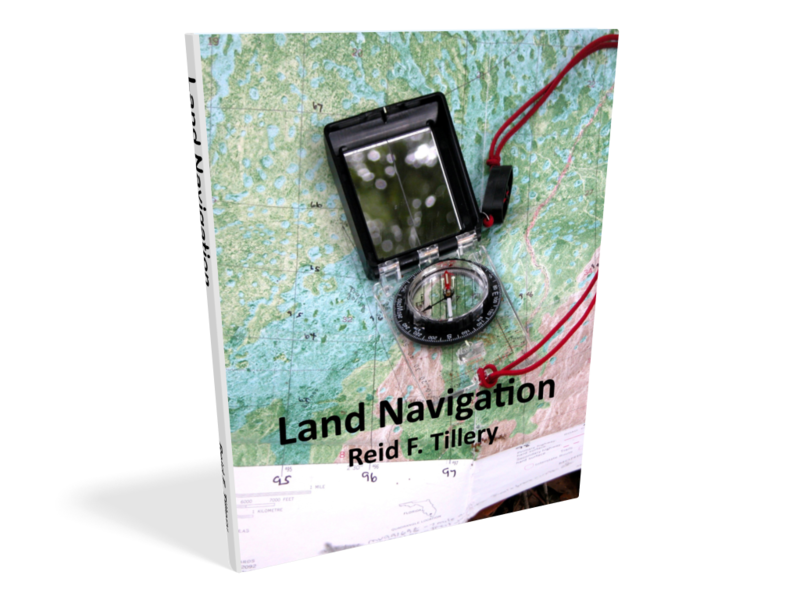 As mentioned on other pages, you don't actually have to see Polaris to know which way is north. All you have to do is use some constellation or star grouping to point the way to where Polaris is, and you can find north. After some practice, just a glance at a pointer constellation such as the Charioteer can help you orient yourself with regard to direction.